Jessie is the history hound in our house. I ain't never been much. One of the many things I have never known much about was the Alamo. That's where we visited today! 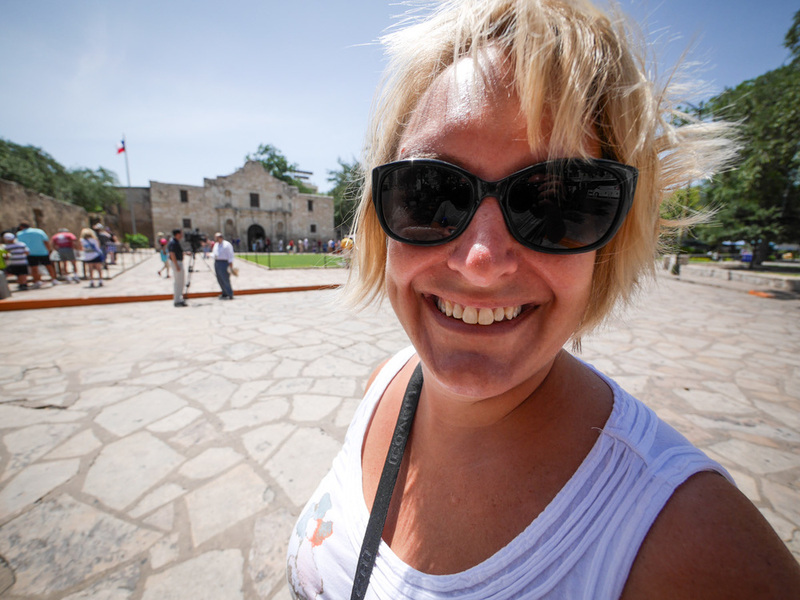 I had heard from other people who had visited that the Alamo is strangely sat in the middle of San Antonio and that it is smaller than you'd expect. I'm glad I knew that much, else I would have been surprised on both counts. 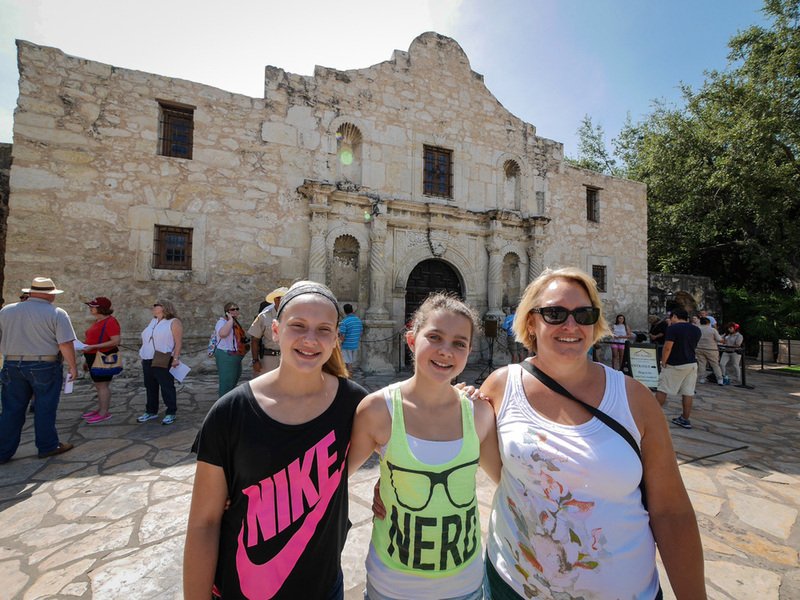 Visitors may not take photos inside the Alamo shrine. I was a good boy and didn't try to get one past The Man. But there wasn't much to take pics of inside anyway. Some old swords and relics of the time. And there was a line of people to see plaqued lists of names of those who fell in the siege of the Alamo. Struck me as strange that these people were so into the history of this place. I read the brochure but it wasn't sinking in for me. This oak tree was 40 years old when it was transplanted onto the Alamo grounds in 1912. That's interesting. After walking through the shrine we watched a 15 minute movie presentation that explained what happened here. I kind of get it now. There were Americans living in the Mexican province of Texas who were given the right to live there. But then the president of Mexico Santa Anna changed his mind and wanted them to leave. The Americans weren't having it so they rebelled. The Mexican army came in, led by the president himself, to put an end to the uprising. A small number of American settlers got surrounded and pinned into the Alamo where they put up a fight for 13 days. Twenty brave messengers sent out letters asking for reinforcements to come save them but only 35 ragtag folks came to their aid. The 200 men fought bravely against impossible odds and all died. So remember the Alamo. Even when things look bleak, when circumstances are at their worst, you can send messages begging for help and not get much. And then die. Texas are stoked for the Alamo, even studying the miniatures display in the gift shop. Dramatic lighting helpfully provided by the sun. Good timing. All in all, a cool place to see. I may not feel the religious pull of my fellow visitors today, but I think it is neat they can feel so strongly about something.